If you have never made attempts to learn a different script, most of what you see in a strange material will absolutely have a mysterious look, different and bizarre. There are a variety of scripts around the world that are difficult to comprehend, but there are very simple ones like the Korean Hangul. How to create Hangul and learn Korean alphabet fast. If in some instances you visited the Eastern countries and somehow came across Korean writing, probably it was the Korean Hangul. 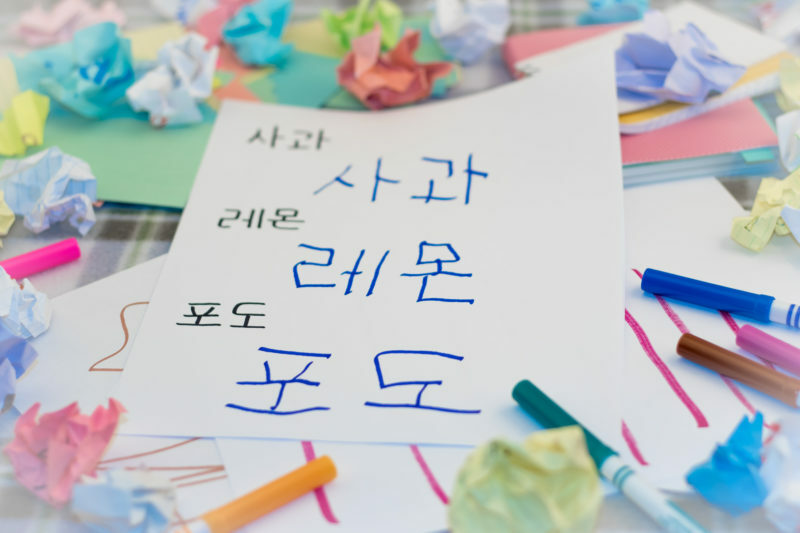 Hangul can be described as an alphabet that was long crafted instead of being recently developed. The story behind this whole parable is that there was a Korean king that served long ago. The king was named Zedong. During his tenure, he wanted to introduce and promote literacy to the Korean people. The first people that Sejong wanted to benefit were his soldiers. Sejong was in fear because the Chinese writing system that was referred to as hanzi in Chinese. The writing system was referred to as hanja in Korean. The system was too challenging and complicated to grasp. It didn’t suitably collate with how the Korean spoke. The king needed to come up with a method that would prove the easiest way to learn Korean. The Great King set up a competition where all linguists were competing to develop a writing system that was specifically designed for the Korean people. He wished that the language will be simpler to grasp so that all the Koreans could easily understand. Many scripts were created in this contest. The current Hangul that is experienced especially by the Koreans was the one that was selected by the King. This is the Hangul that the king assumed was the fastest way to learn Korean alphabet. Now, people are still mesmerized of why the main agenda was to make the writing simpler yet the writing looks so complicated. Well, the writing is not that complicated. The reason why you find the linguistic so challenging is because you haven’t made an attempt to learn it. It’s so obvious that anything that you have not attempted to learn is always challenging to grasp. In this application, you don’t know how simple Hangul is because you haven’t yet tried it. It’s my belief that anyone who is interested in writing and read Hangul can learn in less than sixty minutes. This includes all the excuses that you might pop up i.e. that you are not good at learning different languages. Other excuses include that you are very old you can no longer read or other reasons like you can’t see very well. Also, I can affirm that some people can also learn Hangul in less than just 20 minutes. Right now you are wondering how exciting it is to completely learn whole new writing in less than 20 minutes. Imagine learning new writing in less time than watching the episode of the favorite show, ‘The Simpsons’. You can learn the Korean alphabet in just 10 minutes. Here is a link that will assist you to quickly learn Korean alphabets fast. The video above is quite short. The video offers a head start making it the fastest way to learn Korean alphabet. Additionally, it will also tutor you so that you can also learn how to write in Hangul. When asked, I would say that’s the best video that I have seen so far. However, the video quality is somehow poor, but it’s worth a checkout. After going through the video and quickly internalized what it’s saying, you can go through comic cartoons or puzzles. Comics are fun, therefore, they will assist you for quizzes and also solidify what you learned in the video posted above. Additionally, you can attempt going through charts that consists of all the vowels and consonants of the whole Hangul alphabet. In some charts that you will get to learn Hangul, you will notice that there are some Hangul combinations that will be in different colors. Don’t get confused, because there are those combinations are not regularly applied and there are those that are not used at all. Also, something unique about Hangul is that every character has its unique reading and it’s always below the character not above the character. When it comes to Korean pronunciation, it’s not always straightforward. In order to manage to translate Korean into English, you might have to write some of the Korean characters differently. After writing, you will realize that the pronunciation is quite closer to what the Korean character say, but technically it won’t be the right transcription. If you are serious about learning Korean, the above video will greatly help but remember to exclude all the Roman characters from the practice session. This way you will learn Korean Hangul quickly. If you omit the Roman characters, you will actually be surprised that it’s the easiest way to learn Korean hangul. You will easily learn to pronounce things in Korean. If you get serious with your studies, you will bump into many published resources that will only focus on the Romanization of Korean. However, experts recommend that you switch focus to learn Hangul first. This is what is more useful and important. After going through several lessons learning Hangul, you will have to learn Romanization so that you will be in a position to read Romanization in various sources and also learn how to suitably spell them. Additionally, many Korean speakers use Romanization on various programs. Some of these programs don’t support the Korean alphabet. However, there are programs that allow you to use the alphabet. It will be up to you to go for those programs. According to Korean linguists, Hangul is like the Roman alphabets that are used in English. It’s not that difficult. Nevertheless, it has two differences. The difference is, the Hangul block syllables and that in Hangul there is no Uppercase and lowercase letters. All the letters in Hangul are written the same. It doesn’t matter how the letters are used, they remain the same. In Hangul, characters are stack in squares so that they form syllables. Also, what you have to remember is that all Korean words may it be a syllable or anything, they always start with a consonant. Thereafter, a vowel will always follow the consonant. The vowel is either placed below or on the right side of the consonant. When placing vowels, don’t just place them randomly, there is always where it should be positioned so that it reads well. In a syllable, there will always be 2, 3 or rarely around four characters. In Korean Hangul, there will never be characters appearing at the top in a row. It’s something that can’t be done. Each character has its position. If characters are misplaced, it won’t read right, probably it will be jibberish.